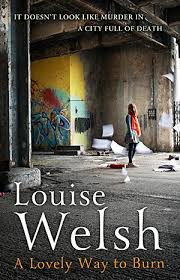 In the acknowledgements, Louise Welsh mentions Terry Nation’s Survivors as a childhood inspiration for her new novel, A Lovely Way to Burn, the first in a proposed Plague Times trilogy. As a similarly youthful admirer of the series, it’s perhaps not surprising that I also enjoyed the novel. Survivors was terrifying in a very adult way – grown-ups might easily shrug off the monsters of Dr Who, but here was something that might actually happen. However, there was also something attractive about the way in which the disease reset the world, an attraction that has continued through the decades and in part explains the popularity of The Walking Dead. There are no zombies in A Lovely Way to Burn – the virus, known only as the Sweats, is potentially all too real – but, like the writers of The Walking Dead, Welsh uses it as a background to her main narrative, a way of ramping up the tension not unlike that of a war-time setting. Like much of her previous work, A Lovely Way to Burn is, at heart, a crime novel. Its protagonist, Stevie Flint (a woman – thankfully a confusion which only arises once) is a journalist, but, in a twist on genre expectations, is currently fronting a TV shopping channel. When she finds her boyfriend, Simon Sharkey, a paediatric surgeon, dead from apparently natural causes (always a sign of foul play in a novel), she decides to investigate further, particularly when she discovers a letter instructing her to deliver a ‘package’ (a laptop) to Malcom Reah. “Trust no-one except Reah.” Reah, of course, is also dead. The ‘trust no-one’ places doubt in both Stevie and the reader’s mind, and closes down most obvious avenues of action to the character. She is forced to unravel the truth about Simon’s death by herself (with only the obligatory computer expert to help her). This turns out to be a complex and compelling medical mystery – but that, of course, is only half the story. Welsh unfolds the progress of the disease even more expertly than the whodunit. She captures well both the panic and the normality: one moment Stevie is facing barricades erected by frightened communities, the next she is driving along a quiet street. The novel’s great strength is that it doesn’t attempt the kind of newsreel setting that is often seen in films. By the novel’s end we have no clear idea of the situation in London, never mind England or the rest of the world. Her final visit to the hospital Simon worked in, now abandoned by all but the dead and dying, makes clear how far things have deteriorated however. 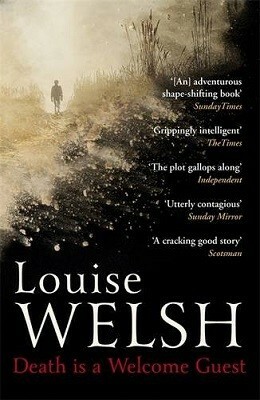 Of course, the theme of Welsh’s crime novel – the dangers of medicine outside moral control – may coincide later with that of her science fiction novel. For now we must be satisfied with the resolution to the murder mystery. As the novel ends, Stevie is leaving London. Personally I can’t wait to find out where she is going. You are currently browsing the archives for the Louise Welsh category.